The Mary Frye claim to Do not Stand at My Grave and Weep seems first to have been publicly pronounced when the poem was was attributed to Mary Frye in 1998 following research by Abigail Van Buren, aka Jeanne Phillips, a widely syndicated American newspaper columnist, whose 'Dear Abby' column apparently communicated directly with Mary Frye concerning original authorship of the poem. 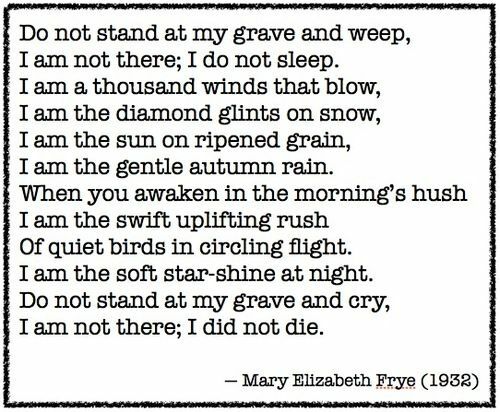 In this touching poem, Do Not Stand at My Grave and Weep, by Mary Frye, she speaks of death in a welcoming tone. She offers words of comfort for those who would mourn for her at her passing, and she seems to welcome death not as the ending of a life, but as the beginning of another.